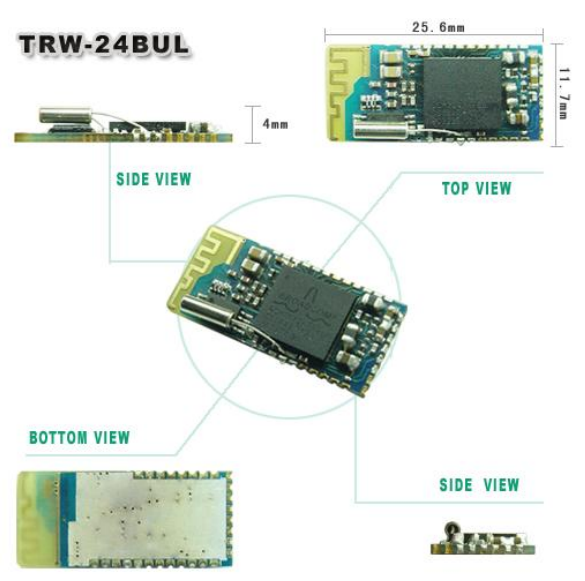 TRW-24BUL is Bluetooth 2.0V data Module. Specialize to build-in Bluetooth Wireless Mouse, and it also can be operated with Bluetooth mouse light inductor and communication with Wii System. The frequency is 2.4GHz; low working voltage design. Lower than 1.9V. WENSHING Bluetooth Module TRW-24BUL is a Bluetooth module using Broadcom BCM2042 Bluetooth controller. This module is ideal for Application in wireless mouse, keyboard, joystick and gamepad. Build-in firmware adheres to Bluetooth HID profile. This module is integrated with PCB antenna, crystal, EEPROM and switching regulators to reduce the external BOM cost. It has been designed to provide ultra low power, low cost and robust communications and fully compliant with Bluetooth radio specification V 2.0. 1. Replace the string wire cable : Connection with wireless Bluetooth may replace the string wire cable. 2. Unifies the Bluetooth and the Internet technology. Uses CPU handling ability which Bluetooth offers, increases multi-function for the equipment, such as build-in WEB human interface stage. 4. Wireless sensor and starter. Use Bluetooth to come to relate the closest equipment with the physical system regulation (sensor, starter and the simple analogy/several IO equipment) connects the supervisory system.